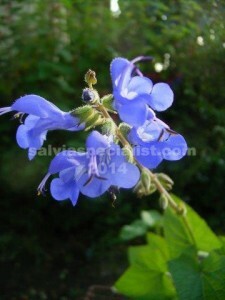 Scutellariodes is a salvia that can be used as a groundcover. It comes from high tropical areas of the Andes. The flowers are a beautiful true blue. It can be grown in shade under trees which is helpful since it doesn’t like frost. This is not a drought hardy salvia. Scutellariodes sends out long shoots which will stay close to the ground unless there is something to support it. It is evergreen and easy enough to propagate some of these pieces.